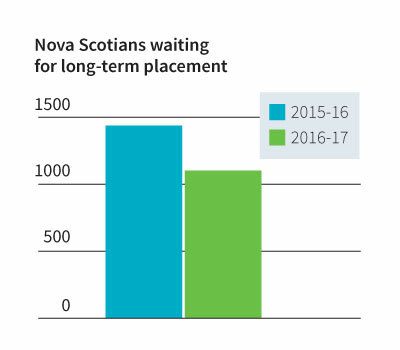 Nova Scotians want to live at home for as long as possible. Every year nearly 29,000 individuals rely on publicly funded home care to live at home, return home from hospital, and delay or prevent a move to long-term care. This year we reduced the wait list for home support by 93 per cent. 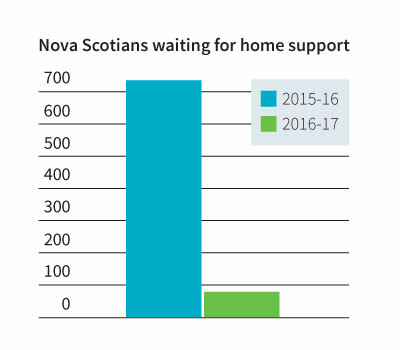 On March 31, 2017 there were 52 Nova Scotians waiting for home support services such as personal care, meal preparation and respite, compared with 691 people the year before. In most areas of the province there is no longer any wait for these services. There are no waits for in-home nursing care. For some, a time may come when living at home is no longer an option, regardless of home care, and moving to long-term care will be needed. More than 10,000 people are supported every year in long-term care homes. This year we improved access to long-term care, reducing the wait list by 20.6 per cent. There were 1,136 people waiting to move to a long-term care home as of March 29, 2017, compared with 1,432 people the year before. All of this has been achieved by implementing policy and practice changes; improving communication with our clients, their families and care providers; streamlining processes to achieve greater efficiency; and using consistent practices across the province. We work to help people return home from hospital with supports in place so that they can take the time they need to consider their options. With this Home First approach, we continue to see more people moving to long-term care from home, instead of directly from hospital.